Kiyoaki Aburaki, Senior Director of the Keizai Koho Center, will be the honored keynote speaker at the JASP Annual Dinner on Thursday, November 9, 2017. This special event will be held at the Duquesne Club in downtown Pittsburgh. 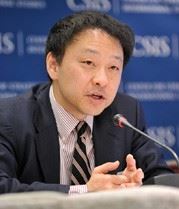 Kiyoaki Aburaki currently serves as Senior Director at Keizai Koho Center (KKC, Japan Institute for Social and Economic Affairs), an affiliated organization of Keidanren (Japan Business Federation). Aburaki also serves as Senior Director for Keidanren Strategic International Initiatives. Aburaki leads a variety of international projects to promote and enhance positive and constructive interactions between the Japanese business community and its key stakeholders outside Japan. Until 2012, Aburaki was based in Washington, D.C. to represent Keidanren, while conducting research activities on international economy, competitiveness, and defense policies at Center for Strategic and International Studies (CSIS). Sign up for our newsletter for details about the silent auction items and grand prize raffle item before the event. Thank you to UPMC for their generous sponsorship!